January 1, 2016: Happy New Year to all! OK, holidays are over; back on the diet and back to "work" programming. Being known to the family as a puzzle lover, I received one called "Aristotle's Number Puzzle" for Christmas this year - nothing to do with Aristotle as far as I can tell. It's a hexagon shaped board made up of of 19 hexagon shaped tiles numbered 1 through 19. The objective is to arrange them into a "magic" hexagon in which values in every horizontal and diagonal row (15 in all) sum to 38. Our "Brute Force" program can find the 12 variations of the solution by defining 15 equations representing sums for the 19 variables . These are all isomorphic versions of the single solution, i.e. 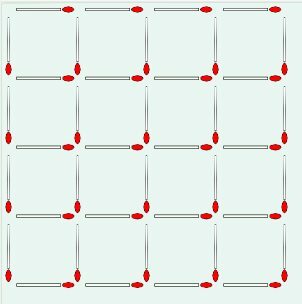 they represent rotations and mirroring of the solution. I decided to investigate further, starting by posting a Delphi Techniques program to draw Hexagonal Boards of various sizes. Here's one with puzzle hints filled in. How many Squares? investigates this problem, from the latest addition to my library of math & puzzle books: Challenging Math Problems, Terry Stickels, Dover Publications, 2015. Program users can investigate various grid sizes and work on solving by clicking to add or remove matchsticks with feedback along the way. For those with a little mathematical curiosity, there are some interesting relationships across grid sizes among the number of matchsticks, the number of squares, and the minimum number of sticks to eliminate . January 28, 2016: It did not take long to recognize the need for for the first two enhancement suggestions in last week's HowManySquares program. HowManySquares Version 2 adds the ability to view remaining squares after each move or on request. Also grids can now be saved and restored. Both features are helpful when working on larger grids. So far I've solved (and saved) up 7x7 grids. Still working on 8x8.